A quality electric shaver can whisk away whiskers and stubble, without causing razor burn or ingrown hairs. Braun is one of the most well-known names in electric shavers. For over 60 years they have refined the foil shaver technology to develop some of the best shaving options for men and the Braun Series 7 is one of their most successful models. Since its release over six years ago the Series 7 has been among the top selling and rated shavers on the market, but is it deserving of all of these sales and praise? Despite not being the top of the line model in Braun’s shaving lineup, we believe it offers the best shave and value for most users who are looking for a new electric shaver. In fact, we rated it the best electric shaver in our recent shaver roundup. Even better, the Series 7’s price has dropped with Braun’s release of the Series 9 in 2015. If you are looking for an electric shaver that will provide an excellent shave and includes all the features and accessories that are important, the Braun Series 7 790cc is our pick. The Intelligent Sonic Technology is what makes the Series 7 shavers stand out from the competition. The electric shaver market was getting repetitive, with no major breakthroughs or innovations. Braun’s Intelligent Sonic Technology adjusts the power of the shaver to the density of your beard allowing it to deliver up to 10,000 micro vibrations per minute. This increase in speed is very effective in shaving hairs of different lengths and thickness. We have found this technology allows the Series 7 to be among the most efficient at requiring only one pass over each area due to the increase in vibration speed that forces the individual hairs into the foils. This increase in power also helps prevent the shaver from catching on stubble, which can cause razor burn or ingrown hairs. Some of the other features found all of the models, such as the personalization settings, contour adaptability, and triple action cutting system help makes the shave more comfortable and adjustable to different skin types. The ability to choose between three speeds allows you to adjust the speed of the shaver depending on whether you are shaving the face or neck area. We found this to be a useful feature that made shaving around the jawline and neck much more comfortable than other shavers that only offer one speed. In the past, one of the chief complaints about Braun foil razors was that they did not contour to the face. Some people also felt that they were not suitable for thicker stubble. With the Braun Series 7 shavers, these issues have been addressed and overcome. All new Braun shavers include a 2-year warranty and durability continue to increase as long as you maintain the shaver. Ensure you clean the shaver regularly and replace the foils ever ~18 months to ensure you are getting the best performance. Depending on the model you choose, you may have a cleaning station, have the option of shaving wet or dry, or other features that are not available in every model. For this reason, you should explore the features offered by each model and compare. Most of the features are shared among the entire line, with some additional features or accessories available on the top of the line models. Some of the lower end models are only available at brick and mortar retailers. While all of the shavers that are part of the Braun Series 7 provide a similar shave, they do have some differences. Here is a closer look at each model, along with their main features. The Braun 799cc is the only model to include Wet and Dry technology. The entire shaver is completely waterproof allowing you to shave dry, as you normally would with an electric shaver, or with foam or gel. The 799c also allows you to shave in the shower as you are getting ready and use the steam to help soften your whiskers – resulting in a more comfortable shave. 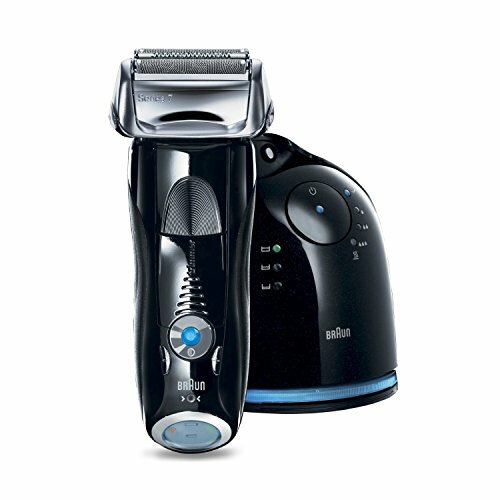 The 799cc is the top-of-the-line Braun Series 7 shaver. It includes all of the features available for the series and is the only Series 7 shaver with wet and dry technology. It also features an advanced LCD display with improved battery indicator. Also included is the Clean and Charge station which ensures that the shaver is always cleaned, charged, and lubricated before each use. The LCD display lets you know the charge level of the battery, when to replace the foil, and the hygiene level of the shaver. This feature is exclusive to the 799cc and the following shaver – the 790cc. The Braun Series 7 790cc Shaver provides all of the same features as the 799cc, but without the wet and dry technology. This is a trade-off between cost and one small feature that you may not even use. If you want the highest end Series 7 shaver and do not anticipate needing to be able to shave with wet skin, then this is the top shaver in the line-up. Overall, the 790cc offers the best balance of advanced shaving features and affordability. The clean and charge station helps keep your shaver clean while the shaving technology keeps your shave close and comfortable. We recommend this model for most users; the price point is usually only slightly higher than the lower models while you the features that are included are well worth the slight increase in price. The 760cc is the lowest model with the quick clean option, allowing you to perform a cleaning cycle in 20-30 seconds if you forgot to clean your shaver after the last use. The 760cc also displays the hygiene status on the LCD display letting you know if the shaver should be cleaned before your next use. The 760cc is available only in black and is the middle entry in the Series 7 lineup. The only differences between this and the 790cc are that this model does not include a hygiene status indicator to let you know when to clean the shaver. You will just need to remember to use the clean and charge station. Also, this model uses an LED display instead of an LCD display – with five levels for the battery indicator instead of 6. The next shaver lacks a few of the advancements found on the other options – including the automatic program selection for using the clean and charge station. It also features an LED indicator with just three battery levels, instead of 5 or 6. Unlike the previous three models, the 750cc does not have automatic program selection for the clean and charge station. 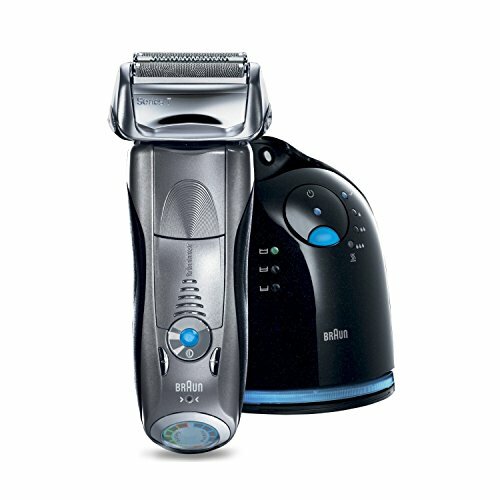 Despite being at the lowest end of the line-up, the Braun Series 7 720s Shaver still offers a great shave without some of the more advanced features available on the higher end models. This model is available at limited retail stores, but we recommend getting one of the higher models (the 790cc or 790cc) as the price difference is usually minimal. The 720s shaver is the only Braun Series 7 shaver without a clean and charge station. If you feel like manually cleaning your shaver, then going with the 720s is the most affordable option. It also features the same LED battery indicator that is found on the 750cc. Most users will be satisfied with any of these shavers. As usual, Braun has developed a solid series of shavers and included a few innovations that separate them from the competition. The intelligent sonic technology really does help create a more comfortable shave. Typically, with a thicker beard, you would seek a rotary shaver, but the sonic vibration and improved contouring of the shaver make these shavers suitable for any guy – regardless of your skin type. Out of the five different models that we examined, the 790cc offers the greatest value. It includes all of the main features of the Braun Series 7 shavers, except for the Wet and Dry Technology. If you currently shave in the shower or would like the flexibility to shave in the shower, the 799cc is completely waterproof for a small premium over the 790cc. While having the option to shave in the shower is a helpful addition, it may not be worth the added cost. These shavers are reasonably priced, but the skipping the wet and dry technology and going with the 790cc gives you the most value for your dollar. Once you have your new shaver, head over to our guide to shaving with an electric shaver and our 5 tips to getting the best electric shave.